Another fantastic image from Doodle Pantry to create with. How adorable is this image? 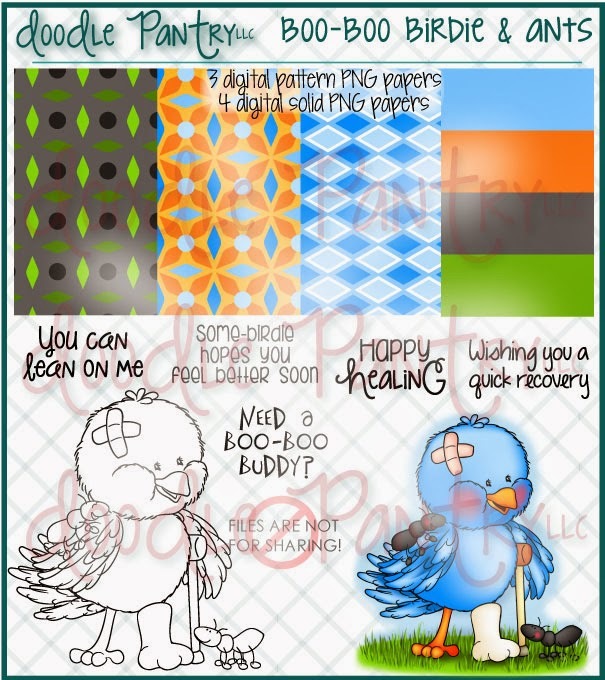 This is the new Boo Boo Birdie and Ants set released this month from Doodle Pantry. As everyone knows by now, I absolutely adore Laurie's birdies and this one went right to the top of my favorites list. The image and both sentiments are from this set. I printed the birdie and ants on Crafter's Companion white card stock and colored it with both Spectrum Noir markers (bird body - GB1, GB4, GB6; beak & leg - GB3, GB5) and Copic markers (cast - C0, C2; ants - C2, C5, C9; crutch E93, E95, E35, E37; bandaid - E93, E95, E97). I wrote "get well soon" on the cast with a micron 05 black pen. The flip card is a cut file from Silhouette Online, but I turned it vertically for a different effect. The base was cut with white card stock and the panels were cut with coral card stock and then embossed with swiss dots from Cuttlebug. The bandaid is a free cut file from SVG Cuts. I used Cameo Coral ink from Stampin' Up to distress the sentiments and the bandaids. The top photo is how it looks closed and the bottom photo is what it looks like when opened. Loved seeing this card open up this morning. Fabulous design and love the colours you chose for this card and beautifully coloured digi. How adorable - great design and super bird. Susan, this is just absolutely SUPER!! cute. I love it. Thanks for the idea of turning the flip card....I never thought of that. And as always, you're coloring is perfect. This is sooo Cute, thank you for joining us over at Fan-Tastic Tuesday, we would love you to come and join us again next week for another fab challenge..
What a cute card and sure to make a person feel better! awhhh...I love your card-both outside and inside....so very cute! I have blog candy...I hope you can join in! I am so glad you joined in with the LEJ Designs Challenge Blogs first monthly challenge. This months theme is a nice easy one 'anything goes'. This is such an adorably cute card. I love that fold, its the first time ive seen it! The colour choices are lovely, image is gorgeous and the sentiments are fun. Great card! I hope you will visit us again and join in with many more of our future monthly challenges. Adorable. I enjoyed seeing your lovely art today and thank you for sharing it with us. Such a cute card, Susan! I love the design and the cute images! The fonts, sentiments and birdie are perfect. Thanks for linking up with us at the Sister Act Challenge Blog. This is so cute Susan. The image is adorable and I love the addition of the plasters. Lovely card, really sweet image. Thanks for joining us at My Craft Creations. Gorgeous card. Love everything, all those beautiful colors and those wonderful embellishments. Thank you for sharing your card with us at Color Me Creative challenge. We look forward in seeing you back again. Wonderful Card. Thanks for joining us at Inky Impressions Challenges this week. Oh Susan what a great card. I love the band aids you used. That bird is adorable. Thanks for joining us this week at Created with love challenges. Love how you flipped the card sideways! Cute image and great design. Thanks for sharing with us at Make It Monday this week. What an adorable design Susan. This is a very sweet card : ) Thanks for playing along with us at Party Time Tuesday's! So darn cute and love the colors and flip card! Super get well type of a card, love the card shape, the embossing and the bandage embellishment! Oh, this is just too stinkin' cute!! I love it, love it. Thanks for joining Inky Impressions Challenge and we look forward to more of your creations here. Oh my gosh! How cute is this?